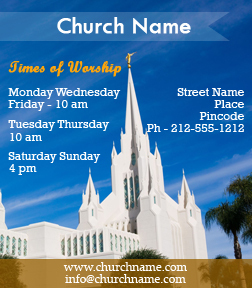 A 3.5 x 4 inches square corner church information magnet is often sought by church officials who wish to share some important church related information with their followers. This magnetic sticker can be offered as a special acknowledgement token during some church sponsored social events or special occasions such as feasts. Church officials who wish to cash on this magnet can stock them in large numbers to avoid shortage.